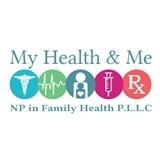 My Health & Me, NP in Family Health P.L.L.C (Brooklyn) - Book Appointment Online! My Health & Me, NP in Family Health P.L.L.C is a private –owned community based practice located in the heart of Brooklyn, New York. At My Health &. Me, NP in Family Health P.L.L.C we provide comprehensive and preventive healthcare for all ages. My Health & Me number one goal is to put your health first and to provide quality health care that encourages self –management, wellness and prevention of diseases through treatment and constant education. We offer an array of services urgent, emergent, episodic, preventive care and chronic disease management. As a courtesy to your Provider and other patients, please note that we have a 24 hour notice for cancellations. We reserve the right to charge a non- refundable cancellation fee or no show fee to your account. If you are unable to keep your appointment please give us a call so we can reschedule your appointment. She’s gentle and very informative. My teenager loves her. She cares. ??? ?